There has been a lot of press regarding the Soring issue surrounding the Tennessee Walking Horse. Fortunately the majority of the breed has not been subjected to this type of “training” method as most TWH owners abhor Soring or abuse of any kind. 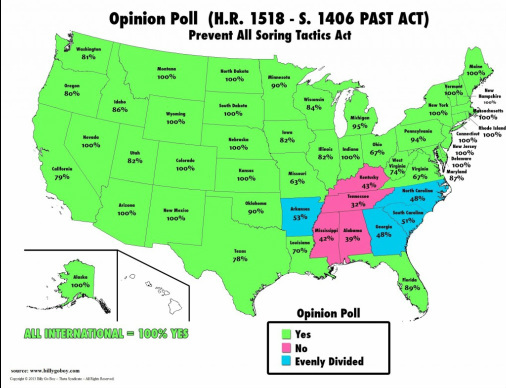 The map to the right shows over whelming support of the PAST act which is designed to end soring. The Tennessee Walking Horse Association of Western Canada and its members are committed to preserving the natural gait and versatility of the Tennessee Walking Horse as it was originally bred to be. Our association takes a hard line on abuse and will not tolerate abuse within club events or shows, be it person to horse or person to person. What is Soring? Soring has several methods being described as, the practise of putting caustic chemicals on the pasterns of the horse to cause pain and discomfort; pressure shoeing or adding foreign objects under the shoe or pad so that stepping causes pain and discomfort. Does TWHAWC have Padded classes? No. We never have and never will. Are their Padded horses in Canada? Not to the best of our knowledge. Keeping a horse on pads is expensive as they require indoor board at all times and a farrier who specializes in padded horses. It is not believed that there are any farriers in Canada that are known to have experience shoeing padded horses. There is however some ex-padded horses in Canada who are now barefoot or light shod. What is TWHAWC doing to stop this abuse? Our club is based in Alberta Canada and is geographically distanced from where soring is taking place. That said, we have a zero tolerance towards soring within our organization. Our Club is affiliated with the Breed Registry in Tennessee (TWHBEA) in order for our voices to be heard in all matters pertaining to the breed. We support the PAST act which is being put forward in the United States Government and look forward to its implementation. We find the acts of a few trainers and owners to be deplorable and inexcusable and will do whatever it takes to ensure that soring never has place within our organization or shows. Seeing as this is predominantly a southern state problem, what is the USA doing to put an end to Soring? Currently the HPA (Horse Protection Act of 1970) requires all TWH and Racking horses to be inspected by a HIO representative at shows, sales, and exhibitions before being shown, exhibited or sold. The HPA has been found lacking in eliminating soring and therefore there is a new bill being brought forwards this year called the PAST act, (Prevent All Soring Tactics). This new bill will see the USDA take over the inspections which will allow for stiffer penalties for those who are found guilty of Soring. The PAST act will also eliminate the use of pads and chains in the show ring thus ending the Padded Performance Division which is at the heart of the soring issue.